Terrazzo has been around for a long time—and recently, it’s been making a comeback! If you’re familiar with this material, it used to be a popular flooring option for schools and office buildings in the 1970s. Now, this retro material is becoming trendy again and making its way into home decor. So many people are searching for terrazzo decor ideas now that Pinterest has even named it a top trend for 2018. What do you think? Are you into it? We couldn’t resist trying a new DIY project. 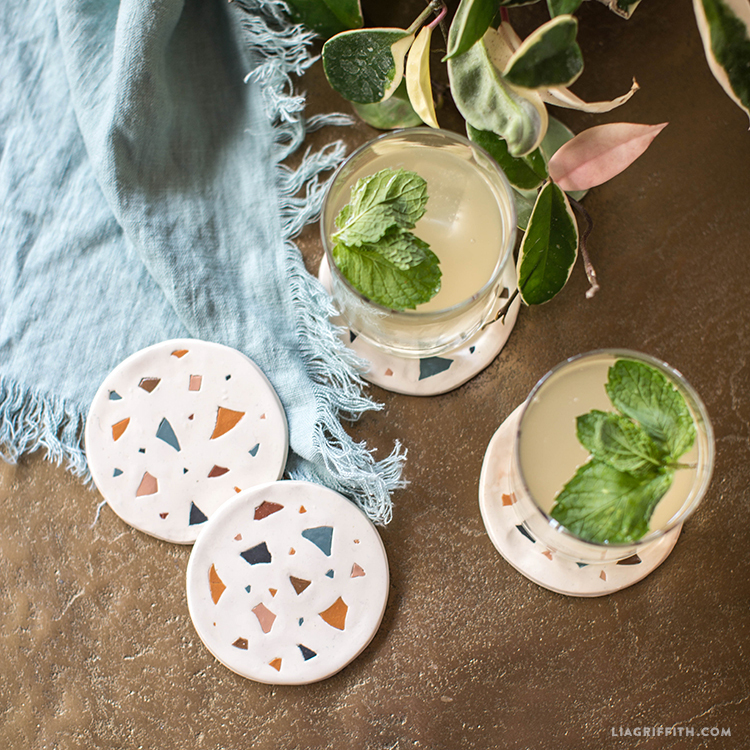 And since terrazzo has such a fun look, our designer Meagan decided to make these faux terrazzo coasters. Whether terrazzo is real or faux, we think it looks stunning! These DIY coasters are also an easy way to add some style to your home. They’ll look cute on your coffee table, end table, or nightstand; stacked on your kitchen counter or shelves; or placed next to plants, table lamps, or any other decor. While we’ve used many materials to make our own coasters before, this is our first time trying to imitate the look of terrazzo. Want more ideas for making your own coasters or transforming your old ones? Check out these felt coasters, cork-turned-chalkboard coasters, and leather coasters. 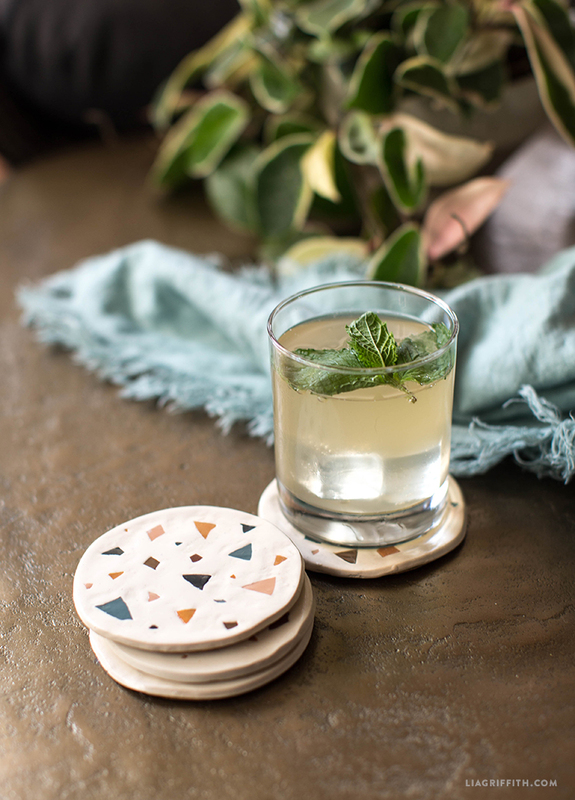 These DIY coasters are easy to make and they’re a simple way to give your home a slightly different look or add a pop of color to neutral furniture. 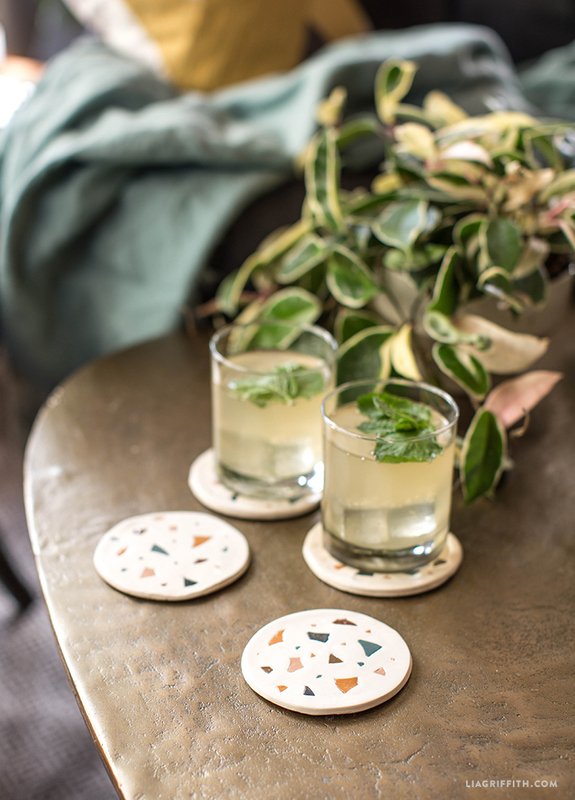 All you need are three tools and three materials to make your own faux terrazzo coasters. One of the simplest ways to make your DIY craft look like terrazzo is to use polymer clay, which we’ve linked to below. Follow the tutorial below or download our printable instructions for making these coasters. Also, if you want to make the linen throw blanket you see in our pictures below, here’s how to do it. Once you make the coasters, let us know how it went! You can always use the hashtag #MadeWithLia to share your DIY projects with us on Instagram. We love seeing what you’re working on, even if it’s something you’ve never tried before!